Bridge – 36 inches wide and at least 6 feet long. Must be sturdy and safe. 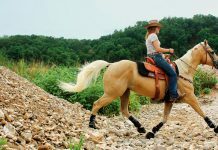 Ride-Overs – A minimum of four wood rails or poles placed in a straight line, a zigzag or circle. May be raised at either or both ends. Standard measurement between poles will depend on speed of gait and elevation. 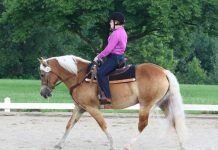 Walk-overs (15 to 24 inches); trot- overs (3 feet to 3 feet 6 inches); lope-overs (6 to 7 feet). Gate – Must be safe for horse and rider to maneuver through. An opening of 6 to 8 feet is adequate. Back-Through Obstacle – Minimum distance between poles or markers should be no less than 28 inches (30 to 36 inches is standard). A back-through constructed of raised poles must be no less that 30 inches apart with an elevation of no more than 24 inches high. Box – Set of four poles placed so that they form a square. Poles must be equal in length and between 5 and 6 feet long. Water Box – Generally painted royal blue, water boxes should be 30 inches wide and 4 to 6 feet long.